Super Lemon Haze has collected more awards over the years than we’ve time to get into right now. Suffice to say, two of these were no less than two Cannabis Cup trophies in a row, back in 2008 and 2009. Having started out as something of an unknown, this incredible Sativa hybrid quickly gained traction and ultimately became one of the most popular contemporary strains of the past 10 years. Originally the work of Arjan of Green House Seeds, it delivers the goods by combining the genetics of Haze, Skunk #1 and Northern Lights #5 into one simply superb package by crossing Lemon Skunk and Super Silver Haze. Unsurprisingly, Super Lemon Haze delivers exactly what you would expect it to deliver on the nose. Boasting an exceptionally high Limonene content – check out our guide to terpenes for more information on that – it’s a predominantly lemon-citrus fragrance, with a dominant sweetness and just a slight hint of sour. Break the buds up and you’ll release the kind of fragrance that will set your mouth watering in an instant. The moment you set light to Super Lemon Haze, the citrus fragrance is overtaken by a powerful note of skunk with a slight hint of incense and exotic spice. On the inhale, there is a huge hint of grapefruit and lemon that make the whole thing downright delicious, while the aftertaste is punctuated primarily by earth and musk. The smoke itself is extremely dense, thick and powerful, leaving behind a lingering aftertaste and aroma that won’t quit. A tricky strain to control if discretion is necessary. Don’t underestimate the power and punch of Super Lemon Haze, despite the fact that the high has a habit of starting slowly. Things start out pretty mellow, but quickly hit overdrive – THC content often going as high as 25%. Which basically means that if you aren’t careful, anxiety and paranoia can kick in. Super Lemon Haze is a textbook social and energetic strain, which can be great for hitting during the day when stress, anxiety or tiredness creep in. In medical circles, Super Lemon Haze has earned a strong reputation for its potential in the treatment of depression, anxiety and mood disorders, along with nausea and loss of appetite. Once again however, the key to success with Super Lemon Haze – however you decide to use it – is to use it sparingly! 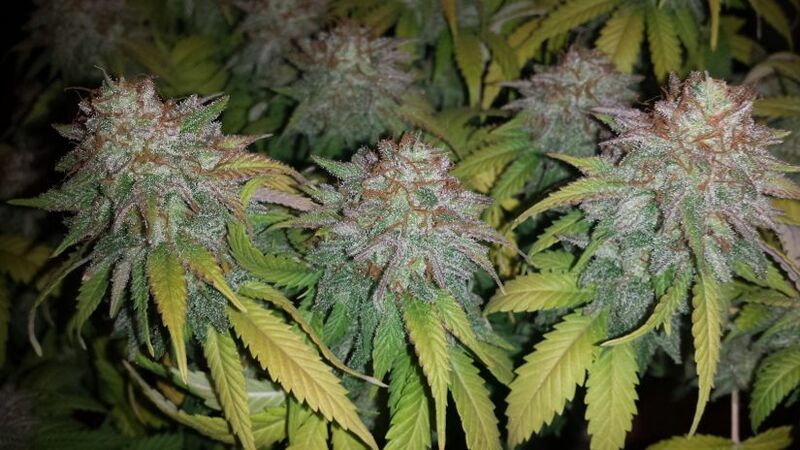 If looking to grow a batch of Super Lemon Haze yourself, it is a relatively easy plant to get to grips with in a controlled indoor growing environment. The plants themselves resemble beautiful mini-Christmas trees, producing a generous amount of buds covered in gorgeous amber crystals. THC concentrations can be from 15% to 25% and beyond, depending on the conditions you provide. Flowering times average somewhere in the region of 10 weeks, while yields have a habit of being excessively generous – sometimes as much as 850g for every square metre. That said, if you have the consistently sunny conditions outdoors Super Lemon Haze requires, it’s possible to harvest a full 1kg from every single plant. The kind of strain that doesn’t ask for a great deal and yet offers so much in return!